Normally I talk about RV antifreeze used to protect the water system in your RV or boat from freezing, but today I want to talk briefly about automotive antifreeze. 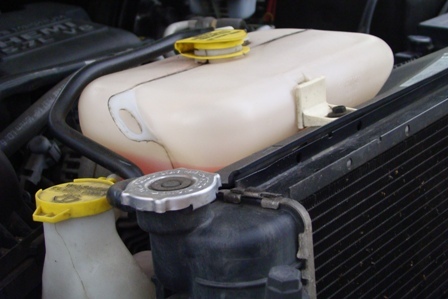 When was the last time you changed the antifreeze in your tow vehicle or motorized RV cooling system? My guess is it has been awhile. The problem is the added strain placed on a tow vehicle or motorhome engine, because of the weight, requires more frequent maintenance intervals like routine oil changes and flushing and replacing antifreeze to help protect the engine. 1) From a business perspective I would do it to increase revenue. The average consumer doesn’t relate to changing antifreeze in their vehicles like they relate to changing the engine oil on a regular basis. If they were educated on the benefits of changing the antifreeze in their vehicles my company profits would increase. 2) The coolant system of any vehicle performs a very important job; to prevent the heat producing engine from overheating and quite possibly seizing up. When you don’t flush and replace the antifreeze periodically rust, scale and corrosion can build-up in the radiator and engine coolant passages, eventually resulting in an overheated engine. Let’s talk briefly about what a vehicle cooling system is intended to do. First of all, if an engine did not have methods to transferr the heat produced through combustion and friction the hot metal parts would melt down and seize-up. Heat the engine produces is basically removed through the exhaust system and through the cooling system. All heat producing components of an internal combustion engine need to be cooled, including the combustion chamber, cylinder heads, cylinder walls and the engine block itself. The way this is done is by circulating coolant through passages around these heat producing areas of the engine. The coolant picks the heat up from the engine and releases it as it circulates through the radiator while air passes through the radiator fins. Water does a good job helping to cool an engine but it has some drawbacks. Most importantly it freezes quickly during colder winter temperatures. Water also causes certain metals to rust and corrode over time. This is why the water in a vehicle cooling system is mixed with what we refer to as antifreeze. 1) It helps to lower the freezing point of water. 2) The corrosion inhibitors that are added help prevent scale and rust build-up in the cooling system. 3) It provides protection against boiling during the hot summer months. 4) It helps keep the engine operating at its most efficient temperature regardless of operating conditions and outside temperatures. When we don’t flush and replace the antifreeze at recommended intervals these additives start to break down and cannot perform the job as effectively as new antifreeze can. Just like used engine oil breaks down and needs to be replaced for maximum lubrication and cooling performance. How many of you have ever witnessed a vehicle sitting along side the road with steam billowing out of the engine compartment from overheating? I cannot count the number of times I have seen this. This is almost always caused by failure of a part within the vehicle’s cooling system. If a radiator hose, heater hose, water pump, thermostat or fan belt fails the result is an overheated engine. And if the coolant system hasn’t been flushed and the antifreeze replaced for several years the result is an overheated engine. The bottom line is periodic inspections of the cooling system components, and flushing and replacing antifreeze at recommended intervals will add years of life to the vehicles engine and prevent untimely breakdowns. Note: Keep in mind that glycol antifreeze is poisonous to humans and pets and that it needs to be disposed of properly. You should follow the guidelines in your vehicle owner’s manual for flushing and replacing antifreeze and make sure you are using the proper type of antifreeze recommended for your particular vehicle. If you don’t feel comfortable doing the job yourself take it to to a repair facility to have the work done. Remember, getting to your destinaion is supposed to be half the fun! 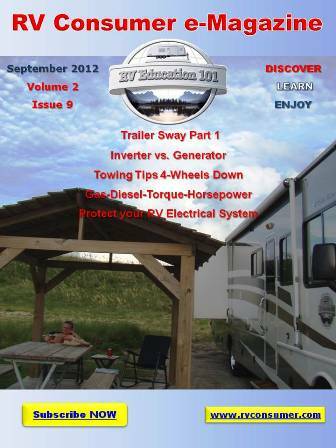 Add the vehicle cooling system checks to your RV pre-trip inspection if you don’t already include it.